My whole adult life I have not eaten tomato soup. I VOWED never to eat it again. In the early years I got to eat tomato soup every day: every.single.day. It came from a can and tasted like a can. Surely you can understand my vow. Both my young grandsons think tomato soup is splendid. Their dad gets it for them in a carton from Trader Joe’s. I’ve wondered how he could do that to them. Obviously I had not yet recovered from my early tomato soup trauma. However, last summer when I had the bumper tomato crop of a lifetime I decided it might be time to introduce those tomatoes to the two cutest kids in the world. Through the weeks Frederick and I worked on variations of tomato soup. He loved them all! So did I. Then summer was over and the tomatoes were history. This summer brought bumper crop #2. Soup time! 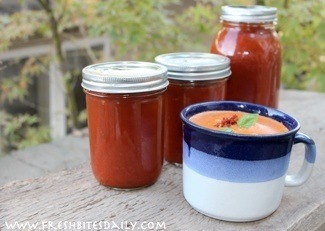 Tomato Soup: Can Your Own! It just so happened that I had begun canning again, thanks to Frederick’s prodding. He wanted to make jams. I ended up canning everything from applesauce to pepper sauce to hot sauce. One difference with the soup: I peeled the tomatoes and squeezed out most of the seeds before putting them in the slow cooker. You could put the fully cooked tomatoes through a sieve to remove the skins and seeds. I preferred my way. You are free to choose your own way. You may even decide that you do not mind skins and seeds in your soup. That’s how I feel about my tomato sauce. Depending on the variety of tomato you use in the soup, you could get quite a broad range of subtle flavors. The salad tomatoes are more sweet and fruity. The paste tomatoes are dense and deeply flavored, insisting on being tomato. Even among the salad tomatoes you will find differences in flavor and sweetness. Try combining two or more varieties for more complex flavors. If you are using paste tomatoes be aware that they have far less liquid in them. You will end up with a thicker soup base that requires proportionately more liquid when you stir up your soup. Try combining paste tomatoes and salad tomatoes for great flavor and texture. Feel free to cook these ingredients on the stove top but with a slow cooker, you get to mix up the vegetables and walk away. For 24 hours they slowly roast without burning. They take on the flavor and aroma that comes only with a long slow cook time. We have four slow cookers. It is not unusual to have all four going at one time and occasionally I borrow a fifth one. My four came from The Salvation Army Thrift Store on a day when they were having a big sale. Don’t you love those kinds of days? Place all ingredients into the slow cooker and stir them well to evenly distribute the garlic and onion. Turn the cooker on low. Keep the cooker uncovered until bedtime and then place the lid slightly ajar to allow steam to escape. Having the lid on will keep the soup base from drying out too much through the night. This base is ready to can anywhere from 12-24 hours after the cooking started. This is handy. You don’t have to feel pressured. Before setting up your canning project, use an immersion blender to puree the soup base. This is always fun to see what color will develop. There is noticeable difference in the shades of red from one tomato variety to another. 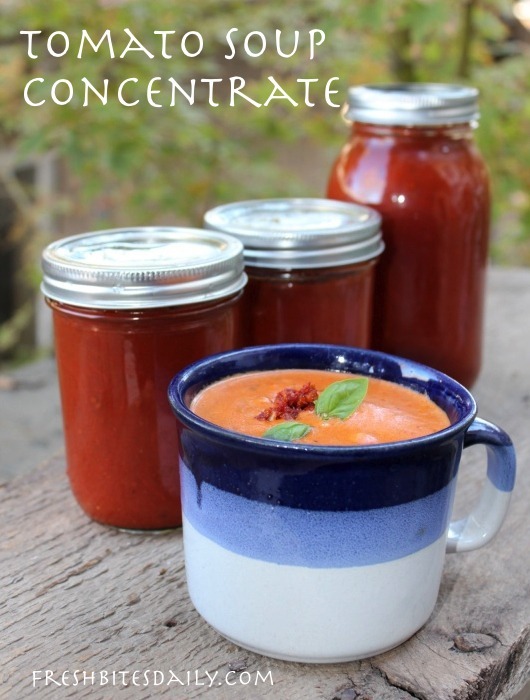 Set up your canning operation. If you need some instruction, here is a video from Ball Canning. When you load your jars, the mixture should be liquid enough that there are no air pockets. If there are air pockets, add a little more boiling water to the total mixture. After allowing the filled and sealed jars to rest for 24 hours, label them and indicate the date on which they were made.